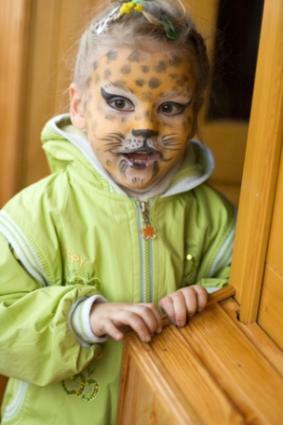 The following leopard face painting ideas are sure to help you capture the purrfect feline look. Considered to be the median size of the three spotted cat varieties, the leopard is agile and stealth. A typical leopard has small rosettes similar to the jaguar, though a jaguar's spots are larger and less packed. While a common leopard is spotted, there are melanistic (dark varieties) known in the feline world as black panthers. If you plan on emulating the wild leopard, you'll most likely choose the spotted variety for the most impact. When paired with a painted bodysuit or leopard print accessories, you can create a full body spotted costume that is both unique and head-turning. Prior to painting, make sure face is cleansed and dried thoroughly for proper adherence of paints. With a moistened sponge, lightly apply white face paint around the exterior shape of the jaw line from ear to chin to ear in a soft semi-circle form no wider than one inch. Blend thoroughly. Next, you'll apply a light tan paint with the same moistened sponge in a light tan or umber shade. Use light and quick strokes for the softest application. Using a medium size brush, draw small irregular shaped rosettes and pack them close together. For the most authentic application, make sure the sizes of the rosettes are differentiating. Use different angles on your brush to achieve varied sizes and shapes. Once the rosettes are created, it's time to fill them in. Using your dark brown paint, fill in the rosettes with a small brush. For varied appearance, you can blend some dark brown paint with black paint to create dark brown coloring, or blend a bit of black with your umber or tan hue to create a cooler brown tone. These varied browns can be used with the basic golden brown paint to achieve a unique, almost three-dimensional application. You can get as creative as you desire to create these varied spots. While you can easily paint a solid black nose to create your leopard face, to keep your unique leopard face painting the focus, you may opt to forgo traditional painted-on black whiskers in lieu of a latex rubber nose with affixed whiskers. Halloween and party supply stores carry a large variety of animal noses that include whiskering details. This cat nose available at Halloween Express is the perfect finishing feline touch! While a typical leopard is neutral and brown toned, that doesn't mean you can't have some fun and opt for a wild cat look instead. For a less traditional leopard face, why not opt for a vivid and bold cat color hue? You can create a purple, pink or green leopard simply by changing your paint palette. You may also choose to create a cat face and wear a human costume for a unique Cosplay effect. As long as you have a bit of time to invest in quality face painting job, you can create an abundance of wild cat looks. Varied cat faces make for a fun and enchanting group costume theme; in fact you may choose to emulate the cast and characters from the Broadway musical Cats. With unique costume headpieces and suits, you can create a wide range of spotted felines sure to add a chilling does of mystery at the next costume party!